HOLLYWOOD, Calif. (February 21, 2012) Called "a powerful thrill ride that is simultaneously gritty and dazzling" (Claudia Puig, USA Today) the global smash hit Mission: Impossible Ghost Protocol explodes onto Blu-ray and DVD (both with UltraViolet(TM)), On Demand and Digital Download April 17, 2012 from Paramount Home Media Distribution. Boasting "a bullet train of action and an arsenal of cool gadgets" (David Germain, Associated Press), Mission: Impossible Ghost Protocol delivers non-stop thrills and breathtaking stunts, including a dizzying ascent up the world's tallest building that Roger Ebert called "one of the most spellbinding stretches of film I've seen." The extraordinary Tom Cruise returns as IMF agent Ethan Hunt, along with an exceptional cast of actors including Jeremy Renner (The Hurt Locker), Simon Pegg (Star Trek), Paula Patton (Precious) and Michael Nyqvist (The Girl With The Dragon Tattoo). With a worldwide box office take of more than $650 million, Mission: Impossible Ghost Protocol is the must-own action-thriller of the year. 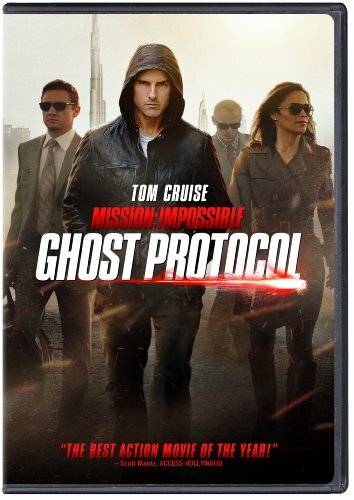 Blamed for the terrorist bombing of the Kremlin, IMF operative Ethan Hunt is disavowed along with the rest of the agency when the President initiates "Ghost Protocol." Left without any resources or backup, Ethan must find a way to clear his agency's name and prevent another attack. To complicate matters further, Ethan is forced to embark on this mission with a team of fellow IMF fugitives whose personal motives he does not fully know. Tom Cruise returns in the starring role as Ethan Hunt and is joined by an international cast that includes Jeremy Renner, Simon Pegg, Paula Patton, Michael Nyqvist, Vladimir Mashkov, �Josh Holloway, Anil Kapoor and Lea Seydoux. Paramount Pictures and Skydance Productions present a Tom Cruise / Bad Robot Production: Mission: Impossible Ghost Protocol . The film is directed by Brad Bird and the executive producers are Jeffrey Chernov, David Ellison, Paul Schwake and Dana Goldberg. The film is produced by Tom Cruise, J.J. Abrams and Bryan Burk and is based on the television series created by Bruce Geller. The screenplay is written by Josh Appelbaum & Andre Nemec.